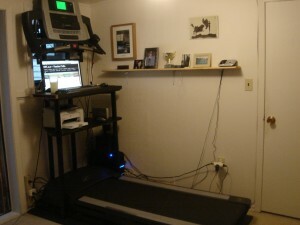 In a previous post, I talked about my latest brainstorm - a treadmill desk. Well, I got my new treadmill several days ago and have started in earnest. No more computer time unless I'm walking away! I've been averaging 10+ km a day, moving at 1.7-2 kph. I can do everything anyone else can. Been skyping and colleagues and students don't even know I'm on the treadmill! I'll be doing my Reform Symposium session tomorrow (4 pm EST) on the Flipped Curriculum and yes, I'll be on "the mill". So you can catch me in action! I won't mind any questions about the treadmill but throw this out there as a challenge to all teachers this coming school year. You don't have to be as obsessive as me but get out there and keep fit, keep active. Part of being an excellent teacher is looking after ourselves and one way is keeping fit, taking time for some exercise and bodily improvement. If you want a close up, here's a quick video I did this aft. I'll try to make a more professional one (and post) later on, once I get my ifit and hook the computer up and start walking across Canada, day by day. That's my goal this school year. I'll keep you posted! But start thinking about your own plan to keep fit this year! If you liked this post, you may enjoy, "Having Teacher Endurance"
Treadmill Desk from David D. on Vimeo.